Glass shower doors are a must. They will not only make your bathroom look bigger, but they are trendier and sleeker. There are tons of options to consider. You can get a framed or frameless shower. You can add it to your tub/shower combo. 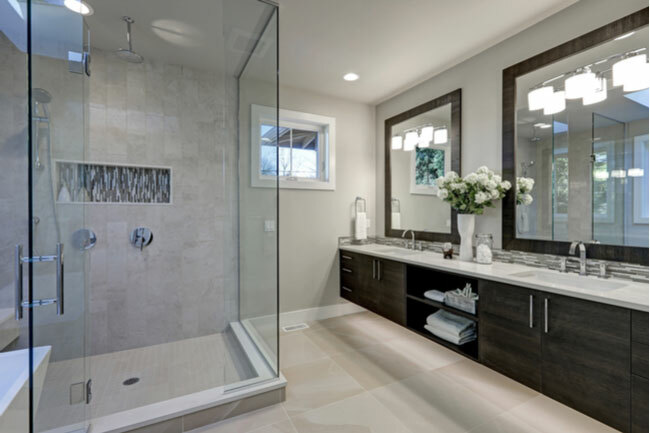 Glass shower doors can also be installed on any angled space. Not to mention, you won’t risk water leaking on the floor or mildew accruing as can often happen with shower curtains. Glass shower doors are also easier to clean. Even just using a squeegee after each shower will prevent any water spots or soap scum from building up. If you maintain it right, your bathroom will look new for years. 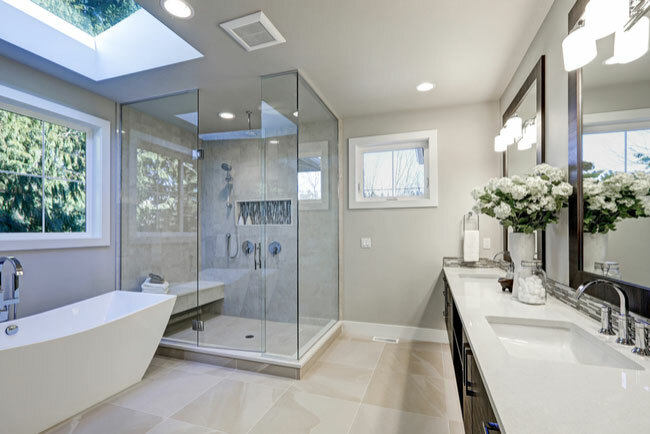 Overall, glass shower doors will open up the whole space and make it look brighter and bigger. 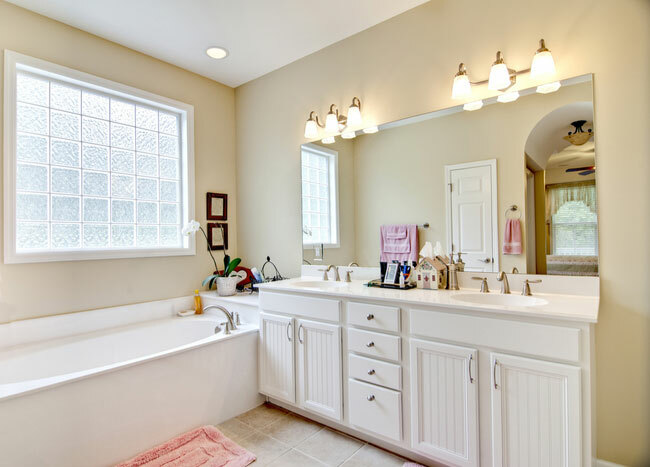 Used in conjunction with a big mirror, your bathroom will be spacious and airy. 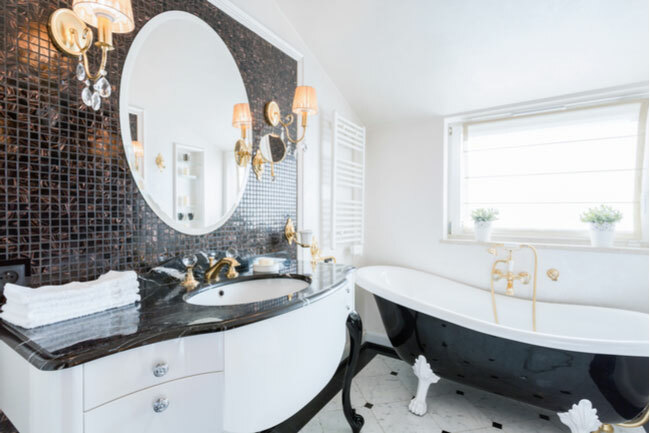 Adding a big mirror to your bathroom is one of the best ways to make the space look bigger and brighten it up. It can also be used as an accent piece that ties the whole room together. This is especially true if you use a stylish mirror such as a rounded mirror or a mirror with an interesting frame. But if you’re going for the sleek look, just getting a massive frameless mirror that goes wall to wall is a great decorative piece that’s eye-catching and functional. It really makes a statement. 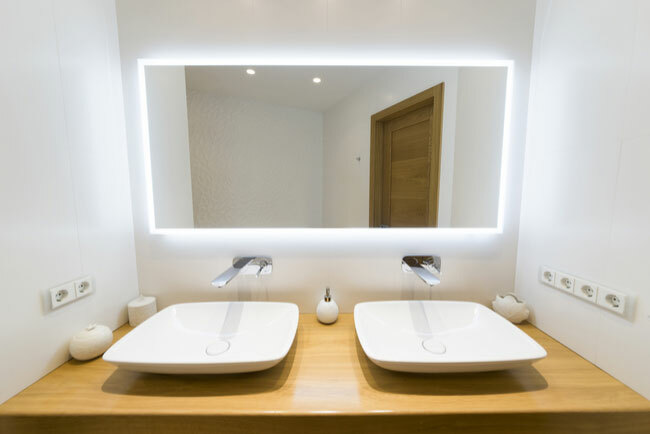 To make it even better, consider adding LED lighting or adding lamp fixtures right next to the mirror. Framed and frameless mirrors will both look great. A frameless mirror will be more seamless and blend into the background. But a framed mirror can be very decorative and serve as the focal point of the room. A big mirror can be integrated into any look or be the standout piece. Overall, using a big mirror can make even the smallest of spaces look bigger and airy. But make sure that if you get a framed mirror, it’s labeled as water resistant or moisture resistant. Some frames, like wood or metal, can absorb moisture. If you want to let in the natural light, but at the same time you want privacy, then frosted windows may be a great option for you. And if your bathroom doesn’t already have windows, adding in a window can be a good way to get more natural light and open the space up. Not only that, but windows will help ventilate the bathroom. One thing you could do is go with a half and half option – frost the bottom half of the window but keep the top part clear so you can see out.